Is there a way to view Opera's total processing power usage? For example the Windows Task Manager lists several entries for Opera; in my case 27. In the browser Shift+Esc has more detailed information, but still doesn't list the processing power as a whole.Is there a way to view the processing power usage as one number? spoke too soon. Issue just resolved itself. When I used VPN it briefly corrected the issue, but only for maybe 30 minutes. I would love to see the option to remove "x" on the right side of tabs. They are not really needed as the middle click will get rid of them and it is too easy to accidentally click the "x" for users who need to to quickly switch from one tab to the next. I have Windows 7x64. I do not use windows updates or Firewalls except for Netnanny. I just installed O35 and it will not load. I have installed the offline version, auto update version, restarted my computer, installed O34, reinstalled O35. O35 will not run. It cycles for a moment and then shuts down. There is no window. 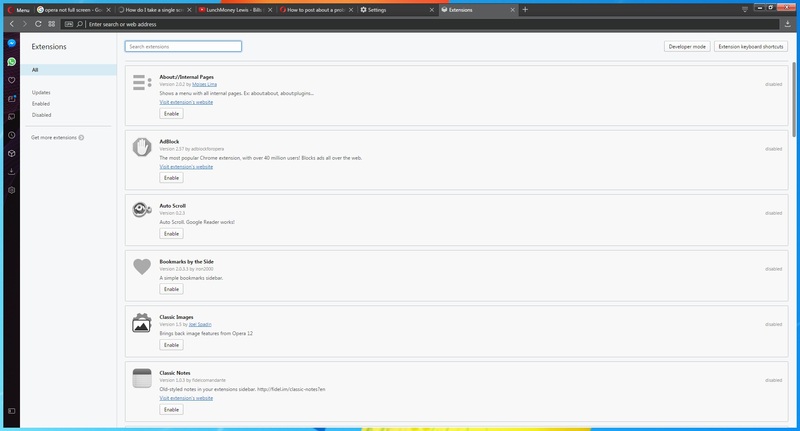 It merely displays in the task manager for a few seconds and then closes. I am going to try a few more things to try and get this to work. My original thought is that it has something to do with th speed dials, but when I change the values and relaunch the browser I do not notice any difference in the speed dials or when I create new speed dials. Does anyone know what they do? RE: Can Opera be masked as Chrome? I can log in, but it is like I am logged out the moment I go anywhere. I can see my account, but the top three "subscribe now", username, and gear located at the top right are missing. At least I know it is something on my end and not Opera's or the NYTimes' end. I'll look into this further on my end when I get home from work. In particular I am trying to get logged in to http://www.nytimes.com/ but Opera is currently unsupported. It works just fine in Chrome, Firefox, and IE though.